One of the reasons I enjoy living in New England is seasonal expectations- the renewal of Spring, the outdoor joys of Summer, the colors and harvest of Fall, and walks in the silent forests of a snowy Winter. In the Fall, we harvest our squash, pumpkins, and root vegetables, pack up our garden for the winter, and go apple picking. 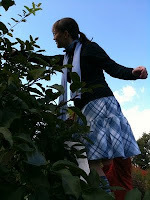 Our favorite spot is Old Ciderpress Farm in Westmoreland, NH with 65 varieties of heirloom apples. You'll not find many of these species in your grocery store. Empire - This cross between the best-selling red varieties Red Delicious and Mcintosh was introduced in 1966. Empire has proved superior to the parent it most resembles, Mac, in redness, flavor and post-harvest life. The creamy white flesh is crisp and juicy. Right off the tree, Empire is an excellent choice for eating out of hand if you like a loud, snapping apple that's sweeter than it is tart. Empires are frequently added to cider blends and can be used for cooking. In storage these apples keep their quality well. Gala - Gala was developed in New Zealand by J.H. Kidd, crossing Golden Delicious and his own Kidd's Orange Red. The pale, creamy flesh is crisp and dense, with a mild, sweet flavor and good aroma. The fruit is not large, but medium in size. In taste tests, Gala easily outscores McIntosh and is considered more sprightly than Golden Delicious. Gala is also used in many cider blends. This apple stores well when refrigerated. Golden Russet - Golden Russet is an early American apple, believed to have sprouted from a seed of an English Russet, It was a commercially marketed variety by the early 1800's. The yellow flesh is crisp, fine-textured, and brightly flavorful, with a noticeable sweetness that made it a traditional favorite for hard cider. The apples can be used for cooking and drying. As with most russets, the apples keep well. Liberty - Described as the most trouble-free of all apples, Liberty is the result of years of work by fruit breeders to develop an apple that would free growers from the endless rounds of repetitive spraying. Released in 1978 by the New York State Agricultural Experiment Station, Liberty has lived up to expectations. A cross of Macoun and an experimental apple variety, it is a deep red apple with great eating and baking qualities. The fruit is medium to large with rich yellow skin overlaid with dark red stripes and splashes. The pale yellow flesh is crisp, tender, juicy, and quite flavorful. Ripens in October and improves in flavor over a couple of months of storage. Our favorites - I'm a Fuji lover, my daughter likes Liberty, and my wife likes Empire. A crisp apple and a mug of cider on a cold New England Day with a light wind and falling leaves. Definitely apple picking time. Here in the mid-west we have a variety called Honey Crisp. Sliced, with a plain non-fat yogurt and chopped walnut topping is a great breakfast. What no Honeycrisp??? I'm from a 4 season state too - Michigan and this variety was introduced a few years ago. It's my favorite at the moment, but its progeny - Tango could replace it. The jury is out. It is great to hear from someone else that loves all four seasons - including Winter, which I love! Honeycrisp is an apple cultivar developed at the Minnesota Agricultural Experiment Station's Horticultural Research Center at the University of Minnesota and released in 1991. Thus, it's not a historical variety and was not included in my description of the visit to the heirloom orchard. Agreed that it's a great apple! What a lovely daughter you have! Sounds like a wonderful way to spend a day with family! Don't forget to core a few different kinds of apples, slice 'em up, dip 'em in some thin batter with a little cinnamon, maple syrup etc...and fry. Apple fritters are a mandatory feature of Fall in our house!